How to search the option you need rapidly? 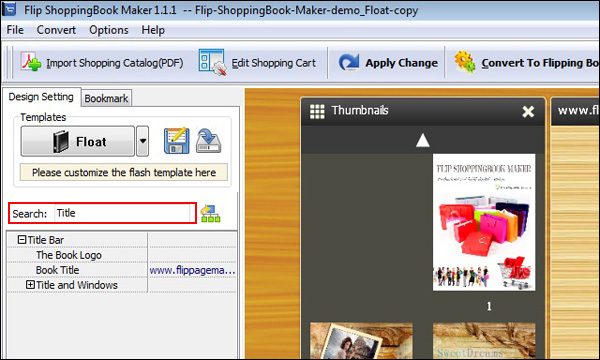 Flippagemaker.com series of software specialize in assisting you in creating flash flipping book, magazine, catalog, report, etc. There are hundreds of options for you choose. However, how to pick out the most needed currently become the primary problem. We provides you a new creative function of Search Settings work out. 1 Launch at Flip ShoppingBook Maker, pay attention to the left setting area. 2 We take the option of Title Bar for example, if we exactly need this function, we should enter the keyword Title in the Searching form. 3 Don’t forget to click the Enter key on the keyboard.